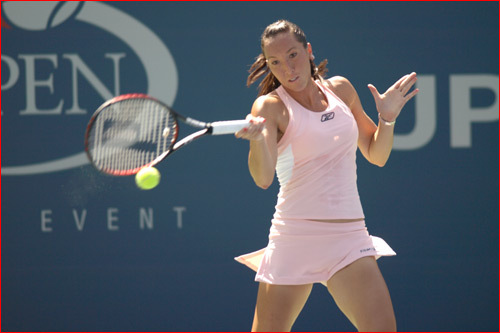 Jelena Jankovic was born February 28, 1985, in Belgrade, Serbia. She is one of the top female tennis players in the world and former world’s number one. She was introduced to tennis by her elder brother and fitness coach Marko at the age of 9. Her mother, Snezana, travels the world with her and is a big influence on her tennis career. Despite her hard work determined attitude, she does not take herself too seriously. This is a good trait but it is not helpful if you want to dominate women’s tennis. Jelena Jankovic won her first Junior National Championship at the age of 11. Following this success, she was sent to Florida where she entered Nick Bollettieri’s training academy. As a junior she won the 2001 Australian Open becoming the junior world’s number one junior player. In 2001 she started to play the WTA tour. She became a pro in 2002. Jankovic has reached the singles final of the US Open (2008) and the singles semifinals of the Australian Open (2008) and the French Open (2007, 2008). In 2007, she won the Wimbledon mixed doubles title with British partner Jamie Murray. She was ranked the world’s number one player for seventeen consecutive weeks until she was overtaken by Serena Williams on February 2, 2009. She was the year-end world’s number one in 2008, the first player in the history of the WTA tour to do this without winning a single Grand Slam title. Jelena has downplayed her inability to win a single Grand Slam Tournament stating that there are a lot of players who have won Grand Slam Tournaments but only 6 women have finished the year as world’s number one. However, she can not be regarded as a great player if she is not able to win several Grand Slam Tournaments during her career. Although Jelena has great ground strokes, she does not have a serve that can bail her out of tight spots. Her emotional outburst causes her to lose points. She is easily distracted on court. Also, she does not take defeat too seriously which is a good characteristic in terms of sportsmanship but may reduce her desire to go all out to win matches. We will have to wait and see if Jelena Jankovic is able to win some Grand Slam Tournaments during her career.